Although no one knows for sure exactly where and when surfing began, there is no doubt that over the centuries the ancient sport of “heʻe nalu” (wave sliding) was perfected, if not invented, by the kings and queens of Hawai’i, long before the 15th century AD. By 1779, riding waves lying down or standing on long, hardwood surfboards was an integral part of Hawaiian culture. Surfboard riding was as layered into the society, religion and myth of the islands as baseball is to the modern United States. Chiefs demonstrated their mastery by their skill in the surf and commoners made themselves famous (and infamous) by the way they handled themselves in the ocean. When Captain Cook arrived in Hawai’i, surfing was deeply rooted in many centuries of Hawaiian legend and culture. Place names had been bestowed because of legendary surfing incidents. The kahuna intoned special chants to christen new surfboards, to bring the surf up and to give courage to the men and women who challenged the big waves. Hawaiian society was distinctly stratified into royal and common classes, and these taboos extended into the surf zone. There were reefs and beaches where the chiefs surfed and reefs and beaches where the commoners surfed. Duke was named after his father, who was named Duke after the Duke of Edinburgh who visited Hawaii in 1869 – in 1920, Duke took Prince Edward surfing at Waikīkī. 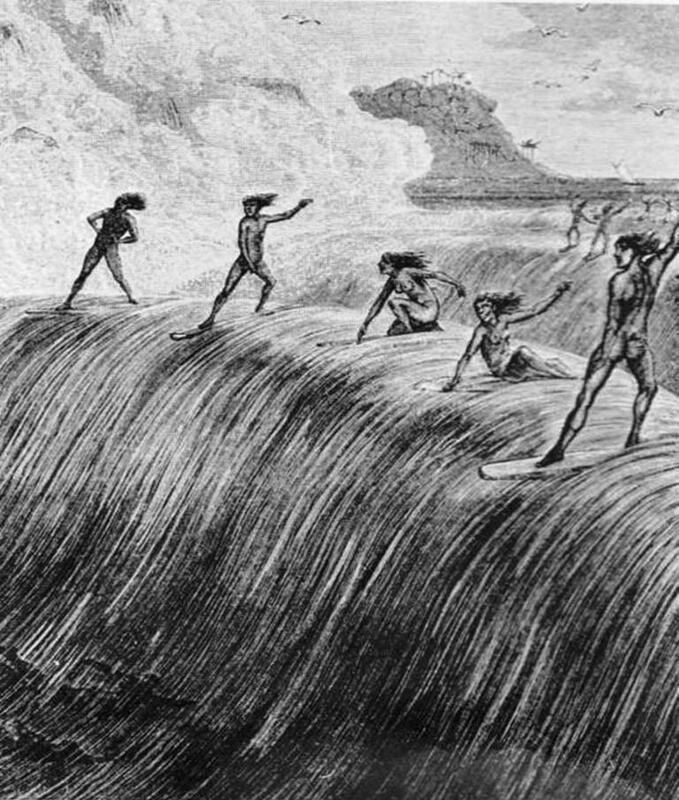 The image shows Hawaiian surfing in the early-1800s (culturemap-org-au.) I have added some other surfing images in a folder of like name in the Photos section on my Facebook and Google+ pages.